When choosing a material as the basis for your home or business space, the possibilities are endless. While some may prefer a sleek finish for a modern air, others opt for a more classic and refined route. If you are searching for the latter, our experts at The Grout Specialist often recommend travertine. Travertine is a specific type of natural stone. Other natural stones used for home and business remodeling purposes may include Limestone, Marble, or Granite. What sets travertine apart from the rest of these stones are its porous holes created by carbon dioxide evasion and unique composition. Available in a variety of colors and finishes, this stone may be just what you’re looking for to add antique elegance to your space. Once you have decided that travertine is right for you, it will take regular upkeep to ensure that your living or business area remains as appealing as the day it was first installed. Some individuals may attempt to repair or restore their travertine themselves, but when combined with a busy schedule and lack of skill, that task may continue to be pushed to the back burner. Travertine that is left to deteriorate will drastically reduce the value and appearance of your property. In order to avoid any unsightly occurrences, it is important to contact a professional. Our experts at The Grout Specialist are well versed in the techniques associated with properly caring for travertine and can help restore your living or business area, no matter what state it is in. Filled Travertine requires refilling over time as the holes become exposed. Travertine tiles are utilized for indoor projects, such as walls or flooring, while travertine pavers are typically used for outdoor areas, such as patio spaces, walkways, pool decks, and driveways. Whether you decided to fill the natural holes found on the travertine or not also determines the repair and restoration techniques that are implemented. Filled travertine requires refilling once time has passed and the holes begin to become exposed. Unfilled travertine will collect dirt and grime, which will need an expert hand to remove all present bacteria. Regardless of your situation, our specialists are here to help! Is your travertine in need of an update? 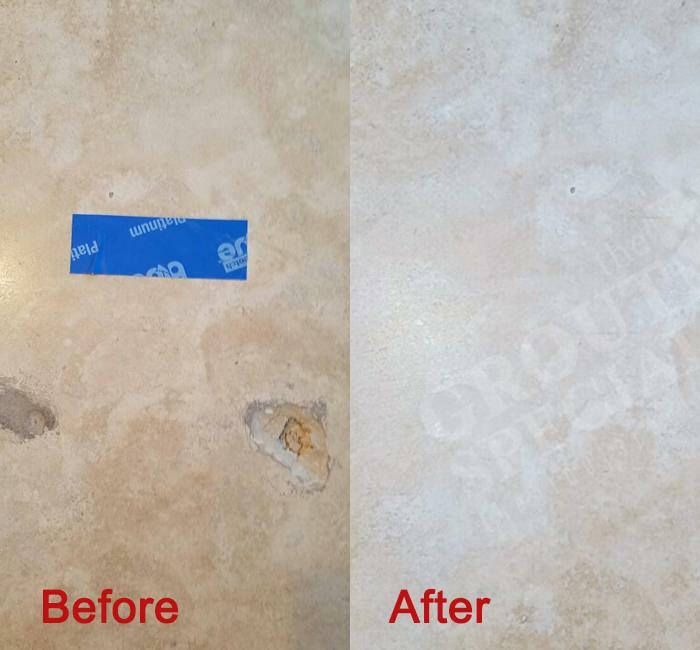 Restore the natural material to its once elegant and rustic state and contact The Grout Specialist today! Our experts will have your home or office space looking brand new in no time at all. Give us a call at +1 (720) 517-8041 or click here to message our team about Travertine Repair!